The Idaho Invasive Species Council is a multi-agency organization that provides direction and planning for combating invasive species throughout the state and for preventing the introduction of other species that may be potentially harmful. The Director of the Idaho State Department of Agriculture (ISDA) chairs the Idaho Invasive Species Council. The Idaho State Department of Agriculture (ISDA) performed a review of the watercraft inspection program from 2009 - 2013. This review documents the accomplishments of the program, lessons learned, and highlights the potential sources for infestation of Zebra/Quagga Mussels into Idaho and the Pacific Northwest. Reminder - Invasive Species Stickers are required to recreate on Idaho's waters. If you have registered your boat already in Idaho, the Invasive Species Sticker is part of the registration. If you have a non-motorized boat, or are out of state, you will need to purchase a sticker. If you have launched in mussel infested waters in the last 30 days, you must have a watercraft inspection before you launch in Idaho. Call 877-336-8676 to schedule a (FREE) inspection. Abandoned pets can become an invasive species problem when overwhelmed owners let them loose into nearby waters or woods. Letting your pets loose is never a good option. Prospective pet owners should make sure they will be able to accommodate all life stages of a pet before buying or adopting it. Releasing plants and animals into the wild may be illegal and can have serious repercussions for natural environments. Activity Book - Activity book to help teach kids about Invasive Species in Idaho. Idaho’s inspection stations are placed on major highways at or near the Idaho state line.These stations inspect all watercraft entering the state looking for aquatic invasive species. Firewood has been shown to be a major pathway of invasive species. People can transport these non-native species long distances on firewood. Revenue generated by the Invasive Species Prevention Stickers allows ISDA to develop a comprehensive statewide program designed to educate the public about invasive species, monitor Idaho water bodies for possible introduction of those species, and inspect and decontaminate watercraft that travel to and through Idaho. Zebra and quagga mussels have not been found in Idaho waters to date. To protect Idaho, ISDA has set up a watercraft inspection station program, focusing on inspecting boats from impacted states as they come across the state line. Call 877-336-8676 to schedule a FREE inspection. Updated invasive species strategic plan released. This strategic plan outlines a framework for how Idaho can continue at the forefront of state efforts to cost-effectively prevent and manage invasive species. 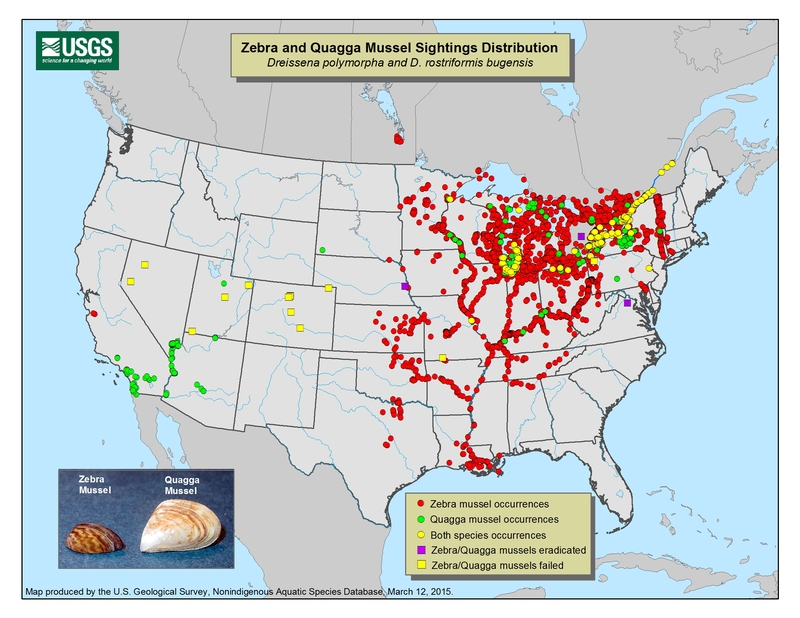 Zebra and quagga mussels are native to the Black and Caspian Seas and were introduced to North America’s Great Lakes in ballast water from Russia in the late 1980s. They were first detected in the western United States in January 2007 in the Lake Mead National Recreation Area. They have since spread throughout the Colorado River system and are now found in several other western states.